← Win Some Oakley Sunglasses!!!! 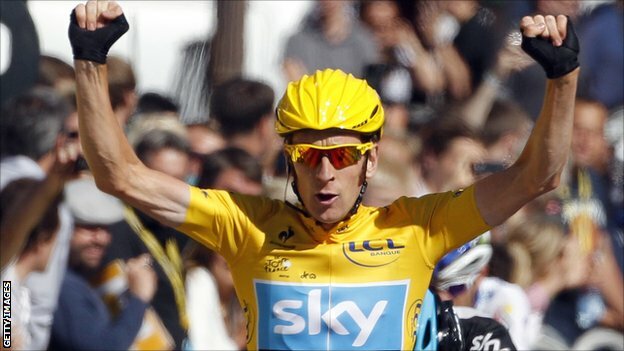 Bradley Wiggins wins Tour De France!!! Huge Congrats to Bradley Wiggins!!! Bradley Wiggins became the first British rider to win the Tour de France as teammate Mark Cavendish claimed a fourth consecutive final-stage victory. Wiggins, 32, finished in the chasing peloton in Sunday’s final stage around the streets of Paris with a winning margin of three minutes and 21 seconds. Fellow Brit and Team Sky team-mate Chris Froome consolidated second place with Italy’s Vincenzo Nibali third. Cavendish won the traditional sprint down the Champs Elysees with some ease. The 27-year old from the Isle of Man is unbeaten in Paris, having also won on his three previous Tour finishes in 2009, 10 and 11. Well Done the whole of Team Sky!! What a way to start the Olympics!! This entry was posted in Sports News!, Sports Profile, Style and Trends, Uncategorized and tagged Bradley Wiggins, Tour De France. Bookmark the permalink.